The Amethyst BioMat is a medical-grade, infrared heating mat used in healing practices all over the world. I first became familiar with and purchased my amethyst mat in 2006 and have used it daily since that time. My primary use of the mat is during meditation – these two practices go hand in hand for me. I also read and watch movies on the mat, as well. The many positive properties that benefit humans, additionally benefit our pets! I leave mine out on the floor with a cover, Bodhi loves to lay on it. I have the Professional Mat which I consider the perfect size for daily, personal use. It has many advantages over the mini-mat or bio belt simply because it can give a full body treatment. It produces a more profound shift in the body and contributes to a more transformative mental experience, as well. I am happy to discuss any version with you to find just the right match for your needs. The BioMat is the only product to combine the triple synergy of far infrared rays, negative ions health benefits and amethyst crystals for a true mind, body and spiritual healing experience. In releasing Life Force energy and releasing blockages, the body has the capacity to heal and bring itself back to balance. This balance is achieved by the infrared rays of light penetrating deeply into the body, warming the cells and tissues evenly throughout. These rays are produced by rows of amethyst crystals that cover the entire surface of the Bio Mat. 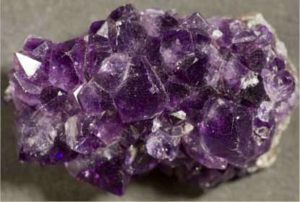 The mat is also infused with tourmaline and copper coiling which boosts the effect of the amethyst – amethyst crystal being one of the highest spiritual crystals. The mat is an exceptional detox tool, as well as providing for reduced stress, anxiety and cortisol levels. Negative Ions open the ion channels, which promotes cellular communication and control the autonomic nervous system, restoring innate healing systems. One of my favorite things to do is hike in a light rain or even go to the woods right after a good rain, just to be marinated in negative ions. The negative ions produced by the bio mat rejuvenate you and provide the freshness and energy you need in a day. The Negative Ions delivered through the Bio-Mat are delivered directly to the body through the skin’s surface via conduction. You will feel the calm, peace and well-being of having been to a spa or receiving a massage next to a beautiful waterfall every time you use the mat. When negative ions are applied to the body, the Calcium and Sodium circulating in the blood are ionized. This changes the blood pH into an alkaline state and has an overall alkalizing effect on the body.